In celebration of the 40th anniversary of the Coronation of Queen Elizabeth II in 1993, the Royal mint issued a number of coins including a Gold Proof ‘Coronation’ Crown. This coin is denominated as £5 (a Crown). Queen Elizabeth II ascended the throne following the death of her Father, King George VI on 6th February 1952. The Coronation was held on 2nd June 1953 in a ceremony at Westminster Abbey. The 1993 Coronation Crown features some unique designs. The Obverse features the Queen’s head in the center of a 8 trumpeters on horseback divided by sceptres and swords. The full inscription reads ‘ELIZABETH II DEI GRATIA REGINA FID DEF FIVE POUNDS’. (Elizabeth II by the Grace of God Queen and Defender of the Faith). 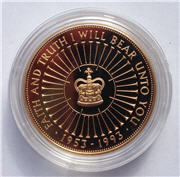 The reverse depicts St. Edward’s crown encircled by forty trumpets, with an outer inscription ‘FAITH AND TRUTH I WILL BEAR UNTO YOU’ and then the dates ‘1953 – 1993’. 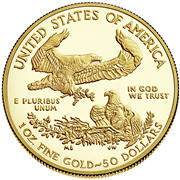 The gold coin is 22 carat (91.6% gold) and weighs 39.94g. Diameter 35mm. 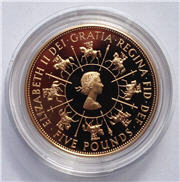 Mintage of the gold proof was limited to 2,500. When it was originally issued by the Royal Mint it was encapsulated and in a red leatherette presentation case. It should have an individually numbered certificate of authenticity (COA). The Royal mint did issue the 1993 coin as Uncirculated, Proof, Silver Proof and Gold Proof.